HAPPY FRIDAY! I hope that you all had a lovely week. Are you in need of some Flower Therapy? Then you’ve come to the right place, since I’m joining my talented blogging friends Shirley, Mary and Pam today for another beautiful Floral Friday! You’ll find the four of us here every first and third Friday of the month, bringing you alluring floral beauty and inspiration. A special thanks to Shirley at Housepitality Designs for being the mastermind behind Floral Friday. Now please join me outside in the back garden for some Spring! We are trying to have spring here in California. Trying. really. My California garden is leafing out, but if it wasn’t for the pansies that are putting on a dazzling show, and a few foxgloves that Mr. FrenchGardenHouse planted for Easter, the garden would still be bare. Luckily I was able to find some beautiful blooming hydrangeas at our local nursery in my favorite heavenly blue color, and cerise pink, too! Planted in large clay pots and strategically placed on the patio, they went a long way to cheer up our outdoor “room” for the holiday. Our theme for this Floral Friday was canning jars. I just love these old French jars, with the clamp down lids. Each one has an enchanting paper label, and they add such charm, don’t they? This arrangement echoes our favorite colors for the back garden, pink, blue, lavender and purple, mixed in with a dose of soft chartreuse green and white. Looking like I just picked them from the garden, the Bells of Ireland, Wax Flower, Queen Anne’s Lace, Statice, Mums and Dianthus mix and mingle in this glorious country bouquet. Although I have several different antique French jars with gorgeous fruit labels in our FrenchGardenHouse online shop right now, I chose this one with the Prunelles Label, the colors are perfect! Prunelle’s are blackthorn or “sloe” berries, they are kissing cousins of plums. When the sloe berries are ready to be picked in the fall, adding France’s wonderful Citadel gin and a few spoons of sugar, sealing the jar and waiting for 2 or more months will result in a wonderful sloe gin concoction reminiscent of the southwest of France. The French drink it in tiny, tiny aperitif glasses, but it’s also delicious spooned over ice cream. Oh Lidy…your garden is beautiful and there is so much to love here! I would love to pull up a chair at your table and enjoy the flowers while sipping on sloe gin aperitif. I have a serious case of French canning jar love between you and Shirley this morning and I love your recipe of ingredients and combination of flowers! Thank you for the dose of spring from your California garden, it’s always a pleasure to visit with you for Floral Friday. I would love for you to be in my garden too! And I could visit you on your beautiful table overlooking the lake. How happy I would be then! Thank you for your beautiful flowers in canning jars, you’ve gifted me with a big dose of spring love! With your styling, you’d never know Spring wasn’t in full bloom! Just gorgeous,Lidy! Love those jars. Ginger,thank you so much. Spring is on the way, hopefully!! So happy that you had a most wonderful Easter with family and friends. It truly is a joy being in your backyard and garden…Today I will be washing down the layers and layers of pollen from our porches! Have a fabulous weekend Lidy….great to be partying with you today…although I would rather to it in person vs. in cyber space!! Lovely post and so much fun to learn from you! I love your photos today with your vignette on the vintage table on your porch. I’m loving the foxgloves and hydrangeas in pots in the photos. Your vintage canning jar has so much personality and the flowers you chose were perfect. I don’t think i’ve seen these jars in our antique shops in my neck of the woods but I will be on the lookout. I always enjoy all the knowledge you share about France and french customs. Bonnie, the foxgloves are my favorites at this time of year. I wish that they would just keep on going and going!! I love the canning jars, I’m always excited to find more from France for FrenchGardenHouse clients, they are sometimes available in my online store. I hope you have a wonderful weekend, too! 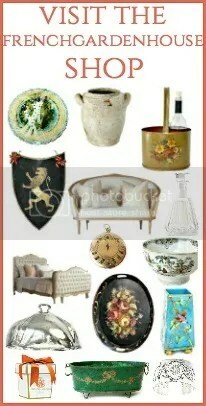 Beautiful, Lidy, and the best part is your use of vintage and antiques wares from your shop! I commented on Shirley’s post….wouldn’t it be wonderful if florists used vintage and antique vessels for all their delivered arrangements?! Thank you for the glimpse of your CA garden and flower arrangements. Just remember, yours is far ahead of much of the country’s, including my region! Have a great weekend. Rita, thanks you! I agree, it would be so wonderful if florists used antique and vintage vessels for their delivered arrangements! I wonder if there are some that do that? It would be fun to know! Love this Blog. What a gorgeous garden. Lidy, I have to admit with Mary that I have serious French canning jar envy. I just need to order from your shop immediately. Your garden is beautiful and how I would love to place my feet under your perfectly vintage table to take in all the loveliness that you create! The combination of flowers is perfect in your jar! Your color palate is one that I love, as well as I have a deep fondness for Bells of Ireland! I can’t help but notice the fabulous cheese presented on the lovely French blue and white stand! Lidy, it is a great pleasure to share Floral Friday with you! While I sit here admiring the beautiful flowers in the vintage jars, I am thinking about how long it will be before the flowers start coming up in my garden which is covered in snow here in Wisconsin. How I long for the warmer days of Spring, and to see the first signs of Snow flowers and Crocus peeking up from the ground. The robins have arrived, and started building their nests, and I’m sure they are looking for some ground that didn’t get covered by the falling snow, so they can find something to eat besides the leftover berries on the shrubs. Your garden looks lovely in the background with the pansies and Foxglove. I purchased some forced bulbs and pansies to but in my large floral container at the entrance of my front porch, only to have to bring the planter into the garage so they wouldn’t freeze. to make it with Juniper Berries. on your Blog, and get inspiration that all good things come in time, even Springtime. Lidy, what a treat to see your lovely arrangement in the wonderful French canning jar. I have many vintage blue mason jars, but I think you have tempted me to purchase some of the French beauties. Your choice of blooms for your arrangement are perfect and your garden is lovely. I can only imagine what it must be later in the season. Thank you for a wonderful post. Wishing you a great weekend! Hi Pamela! I hope your foot/ankle is feeling much, much better. Thanks so much for taking the time to leave a comment, I always love hearing from you! Oh Lidy, I love love your vintage jars and those wonderful labels. Your arrangement is gorgeous, so many pretties! Reading your post offered innovative ideas with flowers I purchased yesterday to decorate the house since, it is still cold here in the mid-Atlantic, and presented a perfect start to the weekend! It is amazing how the jars can add a new dimension to the arrangement. I would love any of the arrangements for my table. If you get a free moment you and hubby should come see the gardens at Park have. They are in full bloom. Lots of bees, butterfly’s and hummingbirds. Jane, I am sure it’s gorgeous there now! I love that both Park and the other restaurant have their own gardens to gather herbs and vegetables from!